First of all, I’d like to thank all of you again who have commented on our web site. We have been pleased to know that so many of you are traveling along with us. A special hello to our friends (through Ben) in Russia–Evgheny, Masha, Grisha, and Katya. 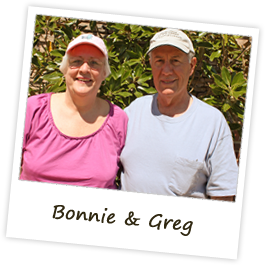 And we need to say Happy Birthday to Greg’s sister, Pam, who along with her husband Werner, were such great hosts for us when we visited them in Cody, Wyoming. It was 37 degrees this morning when we left the hotel in Bozeman, MT. We had a good night’s sleep, a very good continental breakfast, so we were ready for the road by 8:00 a.m. We decided last night that we should not try to go through North Dakota and Minnesota, since our time is short; so we opted to drive back through South Dakota and Illinois on our way to Iowa. It turns out that this was a good decision, because we won’t have to drive so many miles per day and we will have time to enjoy things along the way. 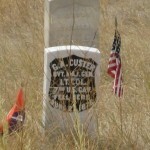 Around lunchtime we came across the Battlefield of the Little Big Horn, Custer’s Last Stand. 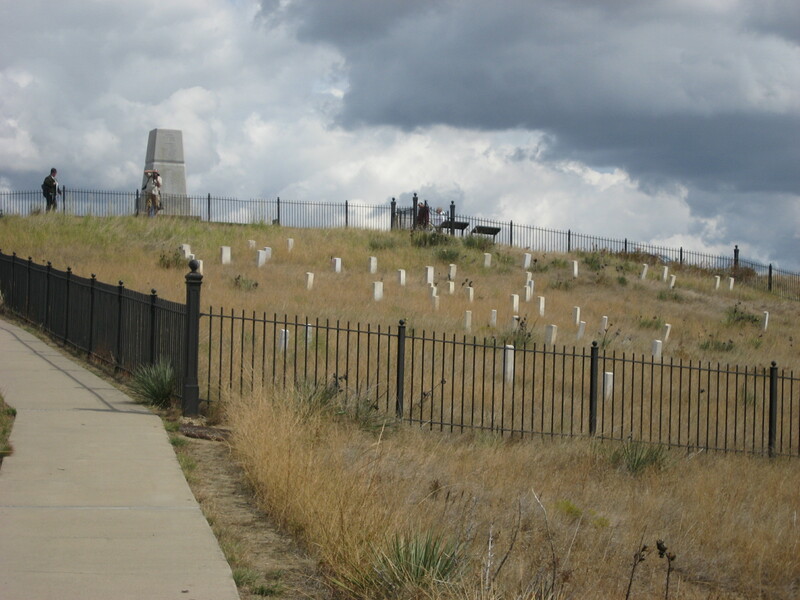 This is a national park and monument, along with the battlefield complete with markers showing where certain things happened. Before we started our visit, we had lunch in our Rig right there in the parking lot of the visitor’s center. Then we started our visit by going through the museum, which was full of artifacts from the battle. It’s absolutely amazing to see notes that Custer wrote while on the battlefield, clothing, buttons, even a wedding ring. The battleground is still full of artifacts, so they are strict about visitor’s picking up anything from the field. 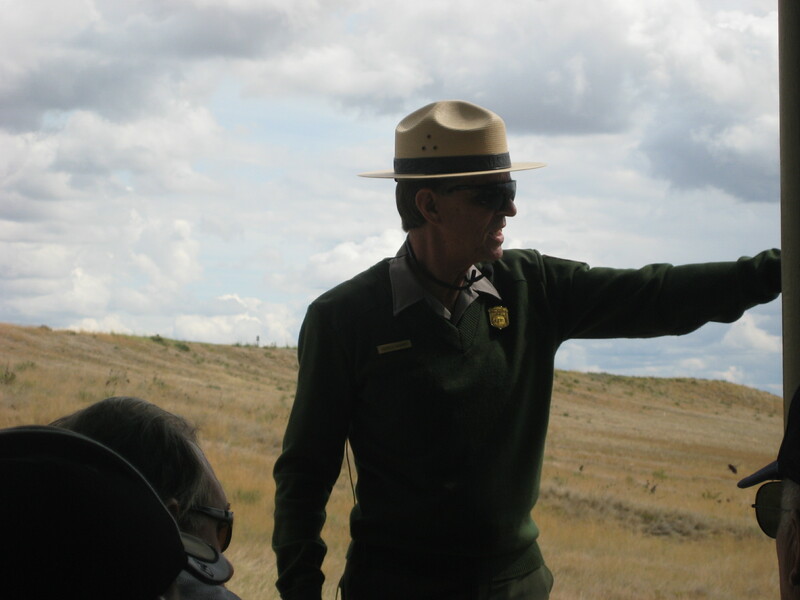 A Park Ranger made a wonderful presentation on the battle as we sat right in the middle of the hill where Custer made his last stand. The battle took place in 1877; Custer was there with 210 men to convince the rogue indian tribes that they should move to the reservations. 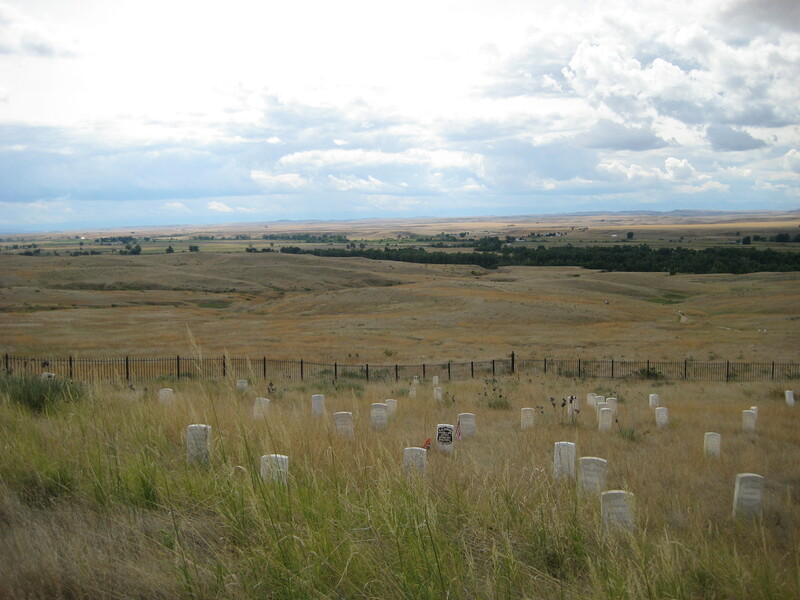 This battlefield is in the middle of the Crow Indian nation, and the Crows were actually helping Custer and his men because the other tribes were their enemies. Unfortunately for Custer and his men, there were 2,000 indians who attacked their position on the hill. The story from indian survivors is that the indians shot so many arrows into the air the sky turned black, and when the arrows came down, they killed many men and horses. All 210 men were killed, including Custer; no number of indians lost is given because there is no record of this. 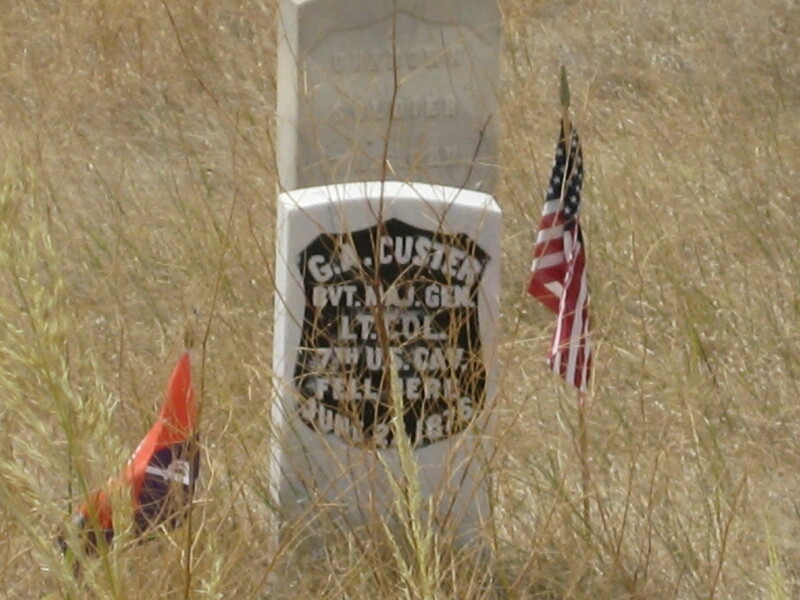 Custer was buried at West Point where he graduated; the other officers’ bodies were shipped home in accordance with their families’ wishes, and the rank and file soldiers were left on the battlefield. 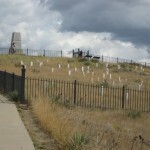 There is a monument which has a mass grave under it, and other markers on the hill, some with names and others not. There are no indians buried here because indians always took their dead back to their villages for burial. There is, however, a monument honoring the indians who fought in this battle. 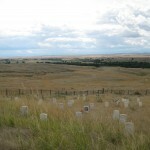 Some of the tribes involved in this battle were Lakotas, Cheyenne, and Sioux. We made it to Sheridan, Wyoming, this afternoon, and we are in a nice little park on the edge of town. 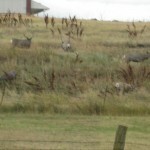 There are five male mule deer right in front of our RV in a field less than 50 yards away. 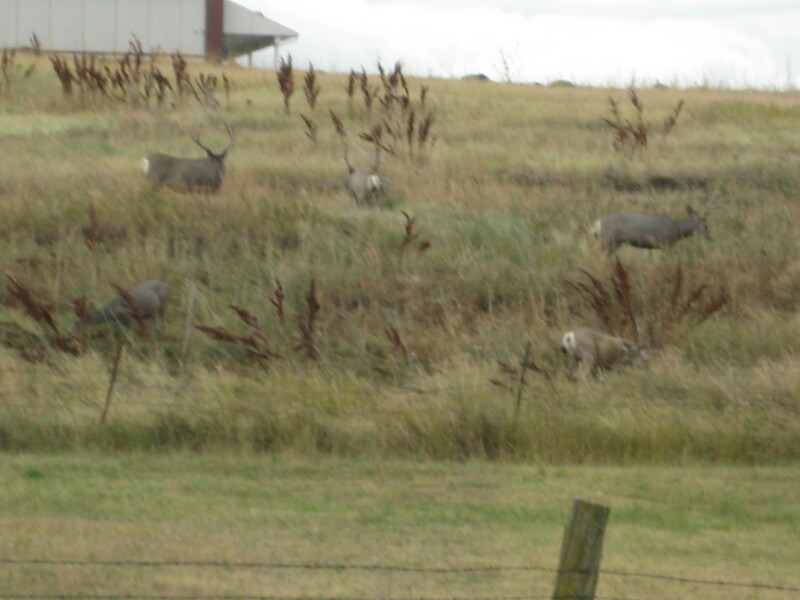 Greg is having fun watching them graze. The campground is small, but we have cable TV, WIFI, and full hookups for $29. The first order of business, after setting up, was to get some laundry done. Luckily, I had the laundry room to myself, so I got everything done before supper. Dinner tonight was beef stew, rice, leftover green beans, and for dessert strawberry shortcake. 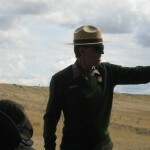 Tomorrow we will head out toward South Dakota and will stay in a campground around Rapid City, South Dakota. Stay tuned.